What’s up New Jersey! We love your fine state (Asbury Lanes, killer diners, no left turns, Snooki, scandalous bridge closures, disco fries! ), but most of all we love how many killer bands you produce. Misfits, Bouncing Souls, Lifetime, Gaslight Anthem, Adrenalin OD… the list goes on. Well, today we’re THRILLED to announce that we’ve signed New Jersey’s newest favorite sons, NIGHT BIRDS! We’ve pined over them for years, releasing their killer 7" Maimed for the Masses last May, and today we officially welcome them to the Fat fold. That’s right! We’ll be releasing their next full-length album, which they’re already knee deep in writing. Vocalist Brian Gorsegner chimes in about it below. 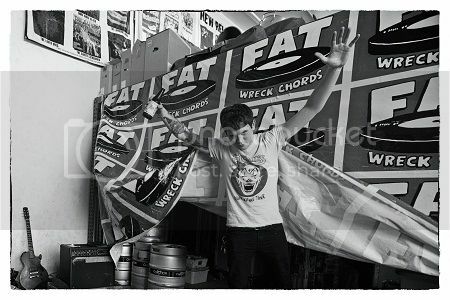 We are excited to announce we are in the early stages of a writing a new album for Fat Wreck Chords to be released some time in 2015. It was a soul crushing, stir crazy winter and we’re really looking forward to getting that grossness out and onto a slab of wax for your listening pleasure. Prepare for what is bound to be next year’s feel bad album of the year. Catch their amazing live show on tour!